For the Industrial Revolution-era designer, see John Kendrew (inventor). 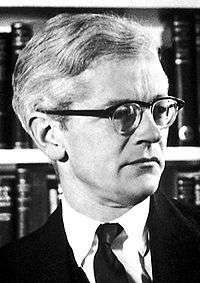 Sir John Cowdery Kendrew, CBE, FRS (24 March 1917 – 23 August 1997) was an English biochemist and crystallographer who shared the 1962 Nobel Prize in Chemistry with Max Perutz; their group in the Cavendish Laboratory investigated the structure of heme-containing proteins. He was born in Oxford, son of Wilford George Kendrew, reader in climatology in the University of Oxford, and Evelyn May Graham Sandburg, art historian. After prep school at the Dragon School in Oxford, he was educated at Clifton College in Bristol, 1930–1936. He attended Trinity College, Cambridge in 1936, as a Major Scholar, graduating in chemistry in 1939. He spent the early months of World War II doing research on reaction kinetics, and then became a member of the Air Ministry Research Establishment, working on radar. In 1940 he became engaged in operational research at the Royal Air Force headquarters, holding the honorary rank of Wing Commander R.A.F. During the war years, he became increasingly interested in biochemical problems, and decided to work on the structure of proteins. In 1945 he approached Max Perutz in the Cavendish Laboratory in Cambridge. Joseph Barcroft, a respiratory physiologist, suggested he might make a comparative protein crystallographic study of adult and fetal sheep hemoglobin, and he started that work. In 1947 he became a Fellow of Peterhouse; and the Medical Research Council (MRC) agreed to create a research unit for the study of the molecular structure of biological systems, under the direction of Sir Lawrence Bragg. In 1954 he became a Reader at the Davy-Faraday Laboratory of the Royal Institution in London. John Kendrew with model of myoglobin in progress. Copyright by the Laboratory of Molecular Biology in Cambridge, England. Kendrew shared the 1962 Nobel Prize for chemistry with Max Perutz for determining the first atomic structures of proteins using X-ray crystallography. Their work was done at what is now the MRC Laboratory of Molecular Biology in Cambridge. Kendrew determined the structure of the protein myoglobin, which stores oxygen in muscle cells. 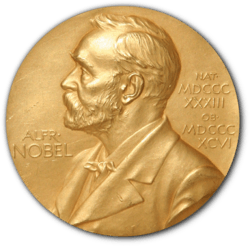 On Saturday 20 October 1962 the award of Nobel prizes to John Kendrew and Max Perutz, and to Crick, Watson, and Wilkins was satirised in a short sketch in the BBC TV programme That Was The Week That Was with the Nobel Prizes being referred to as 'The Alfred Nobel Peace Pools'. In 1947 the MRC agreed to make a research unit for the Study of the Molecular Structure of Biological Systems. The original studies were on the structure of sheep hemoglobin, but when this work had progressed as far as was possible using the resources then available, Kendrew embarked on the study of myoglobin, a molecule only a quarter the size of the hemoglobin molecule. His initial source of raw material was horse heart, but the crystals thus obtained were too small for X-ray analysis. Kendrew realized that the oxygen-conserving tissue of diving mammals could offer a better prospect, and a chance encounter led to his acquiring a large chunk of whale meat from Peru. Whale myoglobin did give large crystals with clean X-ray diffraction patterns. However, the problem still remained insurmountable, until in 1953 Max Perutz discovered that the phase problem in analysis of the diffraction patterns could be solved by multiple isomorphous replacement — comparison of patterns from several crystals; one from the native protein, and others that had been soaked in solutions of heavy metals and had metal ions introduced in different well-defined positions. An electron density map at 6 angstrom (0.6 nanometre) resolution was obtained by 1957, and by 1959 an atomic model could be built at 2 angstrom (0.2 nm) resolution. In 1963 Kendrew became one of the founders of the European Molecular Biology Organization; as well, he founded and was for many years editor-in-chief of the Journal of Molecular Biology. He became Fellow of the American Society of Biological Chemists in 1967 and honorary member of the International Academy of Science. In 1974 he succeeded in persuading governments to establish the European Molecular Biology Laboratory in Heidelberg and became its first director. From 1974 to 1979 he was a Trustee of the British Museum, and from 1974 to 1988 he was successively Secretary General, Vice-President, and President of the International Council of Scientific Unions. After his retirement from the European Molecular Biology Laboratory, Kendrew became President of St John's College at Oxford University, a post he held from 1981 to 1987. Kendrew's entry in Who's Who lists ten other important national and international committees on which he served as either member or chairman. The Kendrew Quadrangle at St John's College in Oxford, officially opened on 16 October 2010, is named after him. His scientific biography is currently being written by Paul Wasserman. Kendrew, JC (Oct 1962). "The structure of globular proteins". Comparative Biochemistry and Physiology. 4 (2–4): 249–52. doi:10.1016/0010-406X(62)90009-9. ISSN 0010-406X. PMID 14031911. Kendrew, JC (Dec 1961). "The three-dimensional structure of a protein molecule". Scientific American. 205 (6): 96–110. doi:10.1038/scientificamerican1261-96. ISSN 0036-8733. PMID 14455128. Watson, HC; Kendrew, JC (May 1961). "The amino-acid sequence of sperm whale myoglobin. Comparison between the amino-acid sequences of sperm whale myoglobin and of human hemoglobin". Nature. 190 (4777): 670–2. Bibcode:1961Natur.190..670W. doi:10.1038/190670a0. ISSN 0028-0836. PMID 13783432. Kendrew, JC; Watson, HC; Strandberg, BE; Dickerson, RE; Phillips, DC; Shore, VC (May 1961). "The amino-acid sequence x-ray methods, and its correlation with chemical data". Nature. 190 (4777): 666–70. Bibcode:1961Natur.190..666K. doi:10.1038/190666a0. ISSN 0028-0836. PMID 13752474. Kendrew, JC (Jul 1959). "Structure and function in myoglobin and other proteins". Federation proceedings. 18 (2, Part 1): 740–51. ISSN 0014-9446. PMID 13672267. Kendrew, JC; Bodo, G; Dintzis, HM; Parrish, RG; Wyckoff, H; Phillips, DC (Mar 1958). "A three-dimensional model of the myoglobin molecule obtained by x-ray analysis". Nature. 181 (4610): 662–6. Bibcode:1958Natur.181..662K. doi:10.1038/181662a0. ISSN 0028-0836. PMID 13517261. Ingram, DJ; Kendrew, JC (Oct 1956). "Orientation of the haem group in myoglobin and its relation to the polypeptide chain direction". Nature. 178 (4539): 905–6. Bibcode:1956Natur.178..905I. doi:10.1038/178905a0. ISSN 0028-0836. PMID 13369569. Kendrew, JC; Parris, RG (Jan 1955). "Imidazole complexes of myoglobin and the position of the haem group". Nature. 175 (4448): 206–7. Bibcode:1955Natur.175..206K. doi:10.1038/175206b0. ISSN 0028-0836. PMID 13235845. Kendrew, JC; Parrish, RG; Marrack, JR; Orlans, ES (Nov 1954). "The species specificity of myoglobin". Nature. 174 (4438): 946–9. Bibcode:1954Natur.174..946K. doi:10.1038/174946a0. ISSN 0028-0836. PMID 13214049. Kendrew, JC (Apr 1949). "Foetal haemoglobin". Endeavour. 8 (30): 80–5. ISSN 0160-9327. PMID 18144277. ↑ "John Cowdery Kendrew". people.embo.org. ↑ "Kendrew Quadrangle". St John's College, Oxford. 2010. Retrieved 7 October 2011.